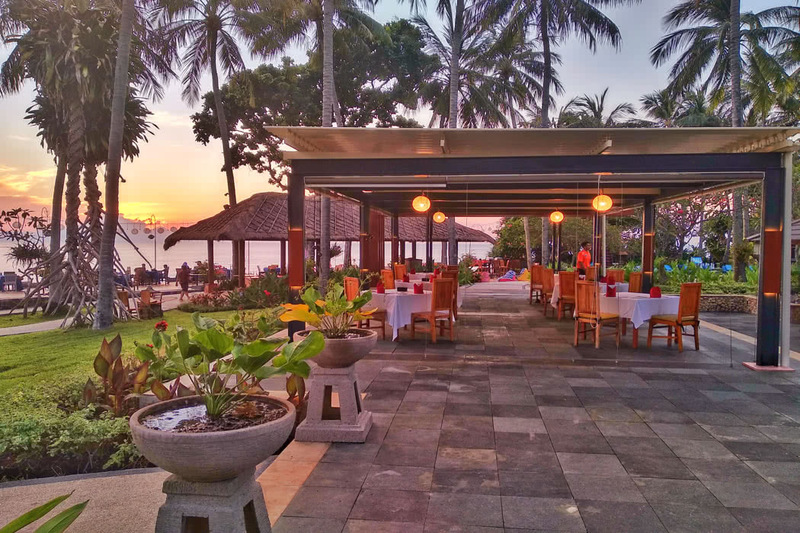 For a stunning beachfront resort with a seriously chilled vibe, look no further than the Holiday Resort Lombok tucked on the Indonesian island of Lombok. 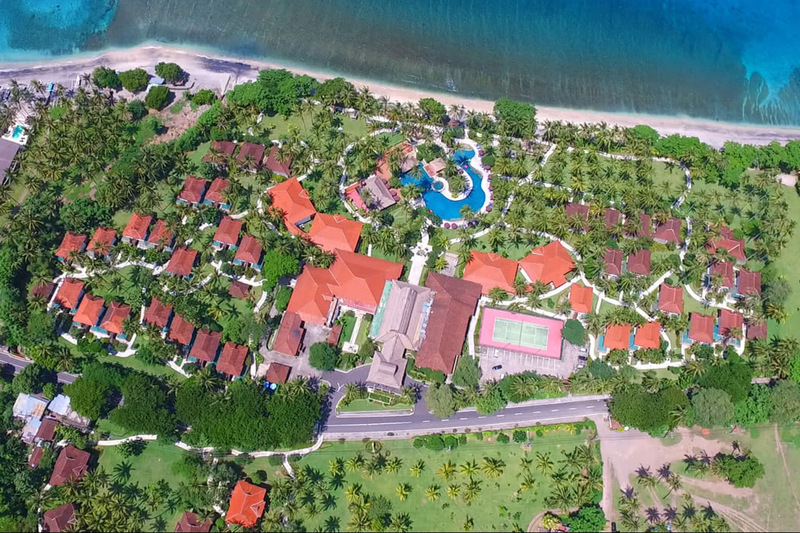 The Holiday Resort Lombok lies nestled on a pristine beach in Mangsit village on the island’s west coast. 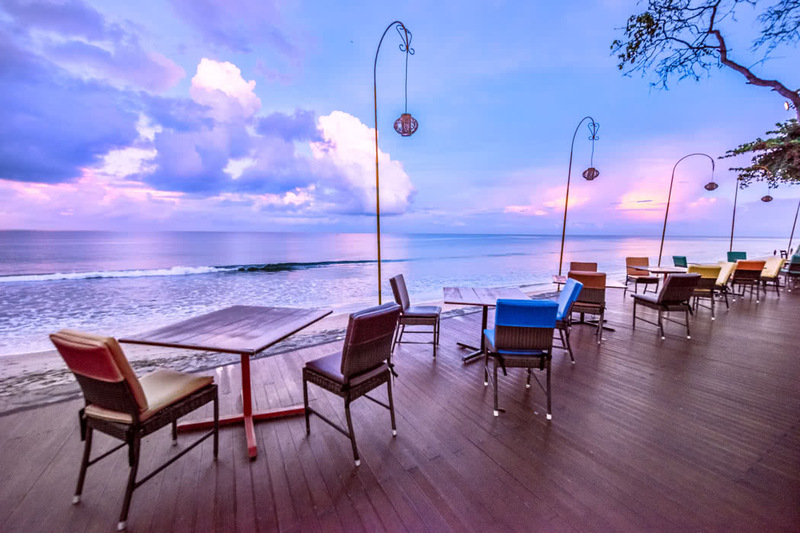 Despite this peaceful location you are just 5 minutes from the centre of Senggigi, the main hub for travellers visiting Lombok which is packed with boutiques, dining and night life. The hotel is a 30-minute drive from Selaparang Airport and an hour and 15 minutes’ drive from Bandara International Lombok Airport. 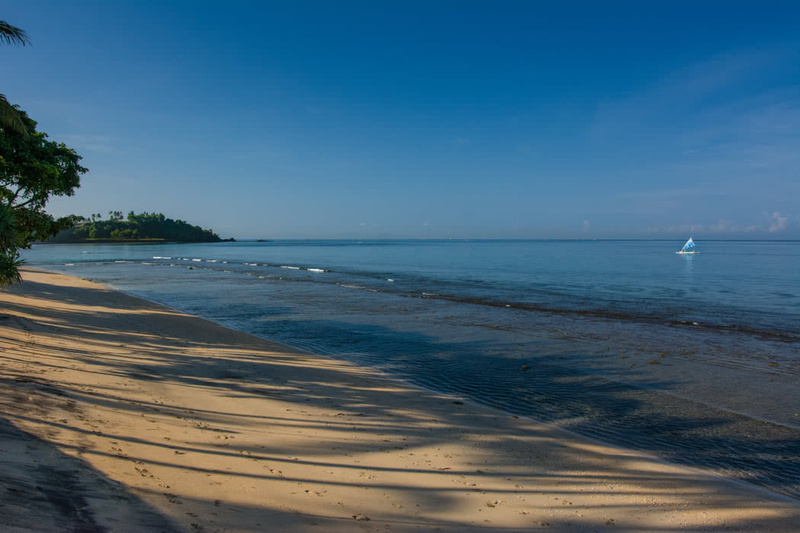 The resort’s beachfront location is a huge part of the appeal of staying here and gives it a true beachy character. 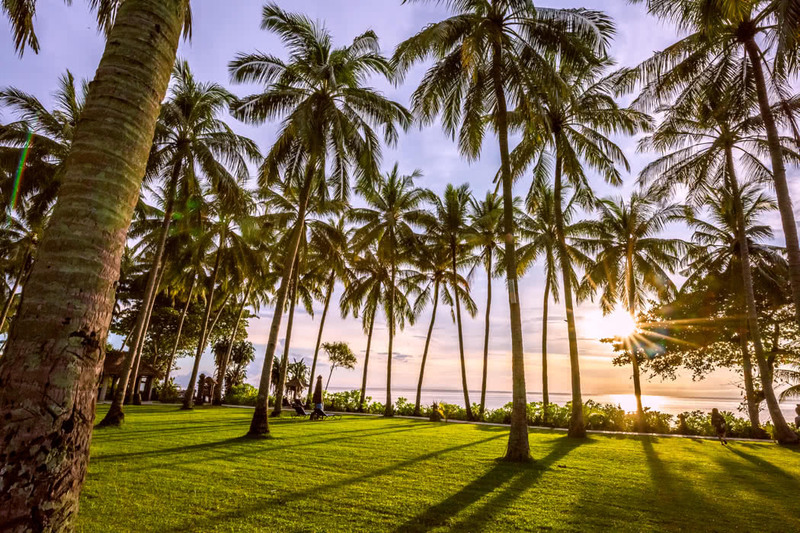 It is also set in 15 hectares of stunning tropical gardens bursting with colour, palm trees and butterflies, which is all set against a lush, green, mountain backdrop. 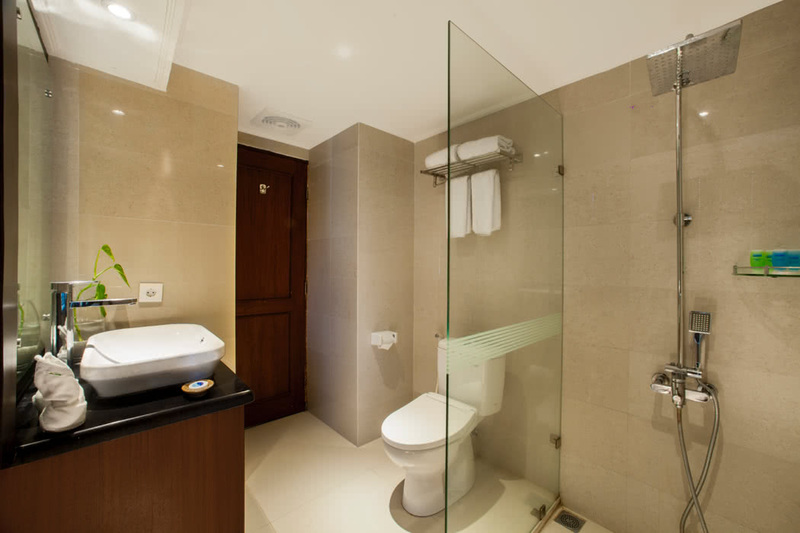 These surrounding give the resort a tranquil, laid back air that is instantly soothing to tired souls. The interior matches those lovely gardens with tropical themed décor and splashes of orange and blue. 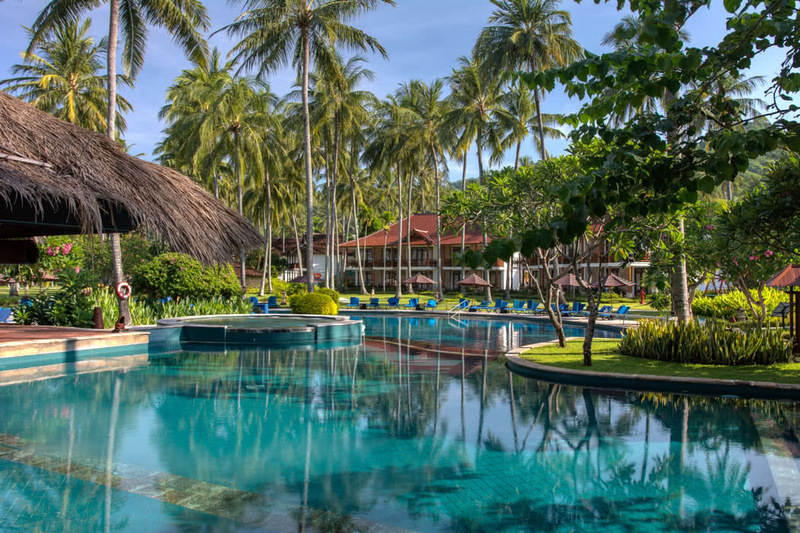 Aside from the lovely beach, there is a stunning palm fringed, lagoon style pool wrapped up in those gardens. 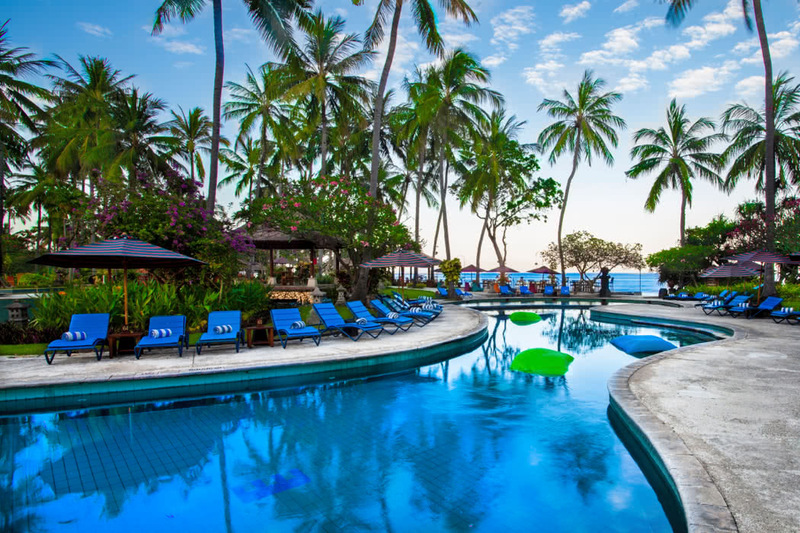 Lie back on a sun lounger with your parasol for shade and feel your cares simply drift away. 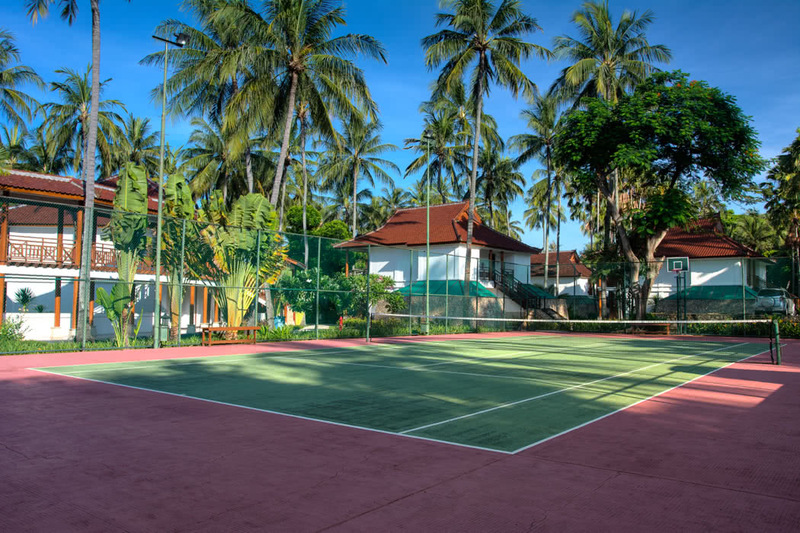 If you want to get a little more active, there’s a 24-hour fitness centre and afterwards treat yourself with a Balinese Massage at the beautiful Mandalika Spa. The spa is surrounded by the beach and the tropical gardens and these continue as the concept behind the treatments. 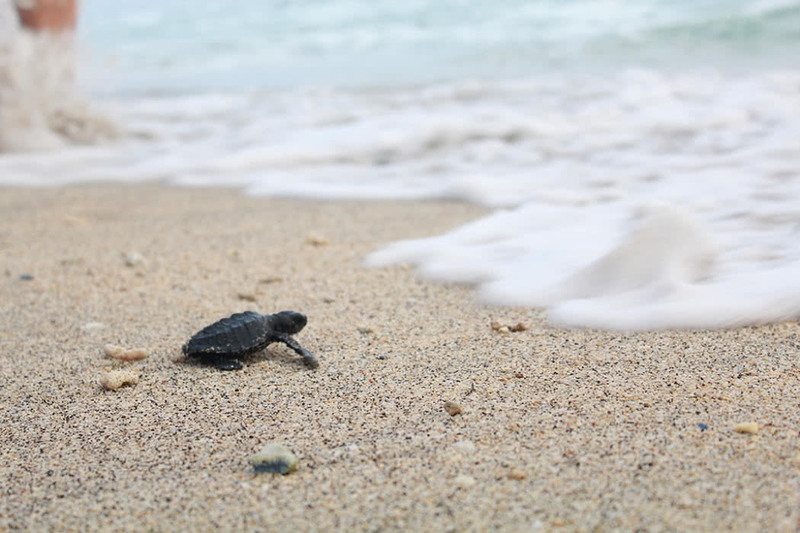 The staff are fantastic; friendly and welcoming, they lay on a host of activities; you can even release a baby turtle into the sea, an unforgettable experience. 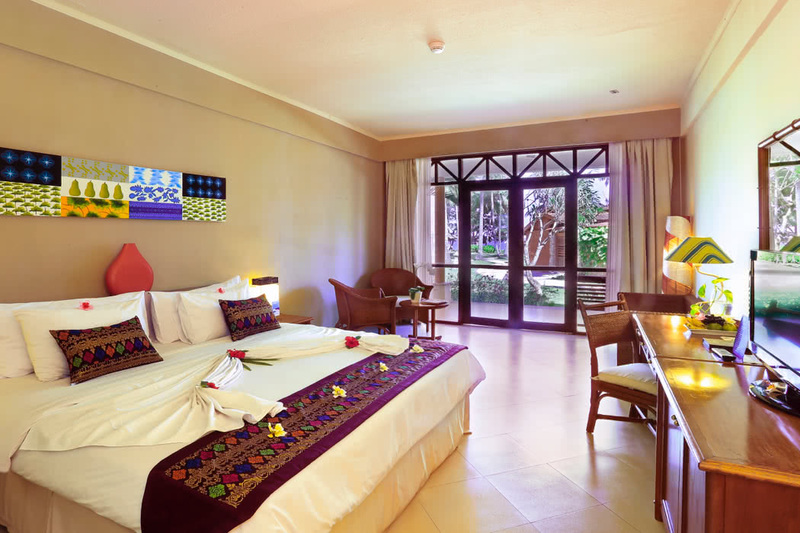 All the 190 air-conditioned rooms, chalets, bungalows and suites have either a balcony or terrace. The Garden Chalets and Ocean View Rooms are perfect if budget is limited, both have an additional sofa bed and so work well for small families. Upgrade to a Beach Bungalow, set, you’ve guessed it, right on the heavenly beach! They have a private terrace and lounge area as well as an exclusive outdoors private bathroom with separate shower and bathtub perfect for relaxed romance under the stars. If you can upgrade further, the Two-Bedroom Mangsit Suites and Beach Garden Suites are ideal for the serious luxury traveller, the later even boasts a Jacuzzi and private pool. 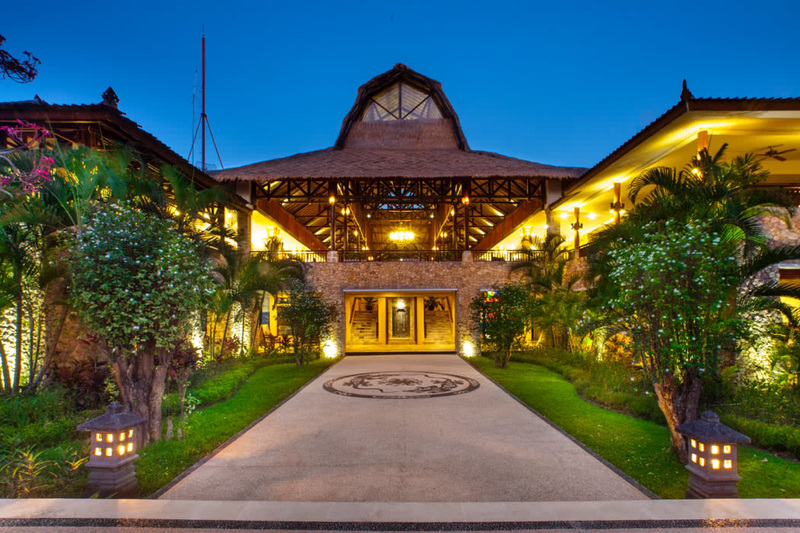 There is a good selection of restaurants and bars at the Holiday Resort Lombok. 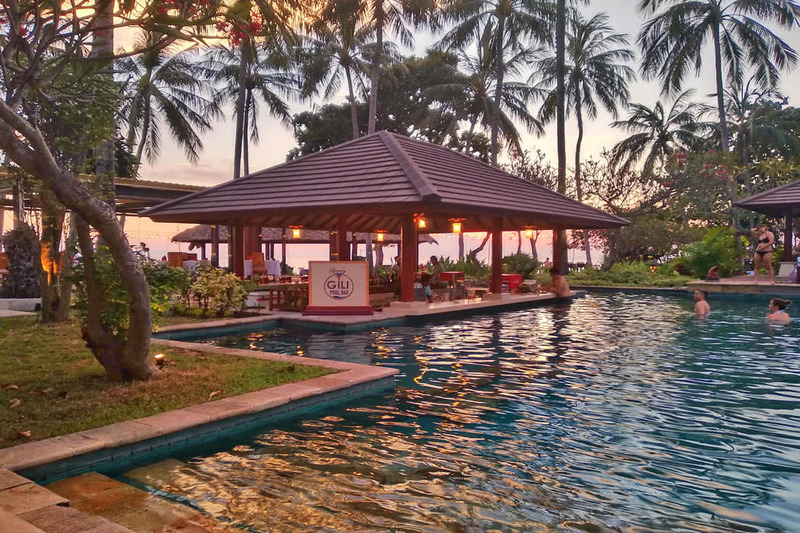 The Rinjani Restaurant serves an authentic Indonesian breakfast overlooking the beach and pool. Come lunch and dinner, check out chic seafood and grill Kayangan Restaurant, they have both buffet and a la carte options and are also a great spot for live music and entertainment in the evenings. For a more relaxed supper, the Gecko Steak Bar serves everything from steak, of course, to classic Mexican dishes. The lively Gili Pool Bar is on hand to refresh you during the day and comes alive as the sun sets so you can chill with a cocktail in hand and enjoy the views of Mangsit Beach.